This Professionally Refurbished Dell 760 Ultra Small Desktop PC is a versatile mainstream desktop solution with proven technology. The flexible OptiPlex 760 delivers a reliable desktop solution to support your home or business' unique needs - from increased user flexibility, including a diskless option to support flexible computing environments, to increased manageability, security, and energy efficiency. The OptiPlex 760 is an ideal mid-range solution, equipped with productivity options you can fine tune to your needs! The Dell Optiplex 760 USFF features high speed Intel Processors, generous memory options, and integrated DVI Video Out. Designed with practical features, the OptiPlex 760 is just one of the reasons Dell is a leader in business desktops - and why OptiPlex is the easiest choice you'll make today. 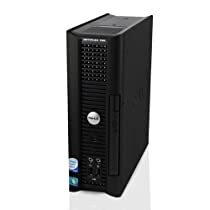 Model: Dell OptiPlex 760 Ultra Small Form Factor - Core 2 Duo 2.8GHz, 4GB RAM, Ports: (7) USB 2.0 (2 front, 5 rear), (1) DVI Out, (1) Parallel, (1) USB WiFi, (1) Ethernet (RJ-45), (2) 3.5mm audio line-in (Stereo/Microphone), (2) 3.5mm audio line-out (Headphone/Speaker). What's in The Box? Refurbished Dell OptiPlex 760 SFF with Power Cable, New ReCircuit® USB Keyboard, Mouse & Mousepad!